When it comes to food, I like to think I’ve eaten a fair amount of varieties, cultures and tried things that most people wouldn’t have. That was until I had some facts thrown my way by Explore Food and Drink Tours and I think I need to go back to the drawing board about my food knowledge! So I’m going to fill you in on these facts as I was a little shocked when I found out the Scotch egg can be traced back to India and North Africa and it was the revival that was claimed in 1738 by Fortnum and Mason. I legit thought it was a British staple that we invented but alas I was wrong! Another, what I thought was a pure British tradition is Fish and Chips and would you have ever guessed that they have actually been traced back to Spain and Portugal before arriving in Britain around the 17th Century! I thought the fabulous British weather and our luxurious beaches that were the original home of Fish and Chips. I wonder how tourists to the UK would feel if one of most classic things to do here, wasn’t as traditional as they actually thought! It seems that Ancient Greece was the home of so many desserts that we instantly think originated in America; food resembling doughnuts were served there many years ago, but were brought in their current form to New York by Dutch settlers, so they really aren’t an American classic! We often think of Cheesecake being the New York Cheesecake but it was those Ancient Greeks waaaay back in the 5th Century when they served the cheesecake to athletes during the Olympics to give them energy. It didn’t reach America until 1872! Some of us, when eating curries love to go all out an order a Vindaloo, but little do most of those that order it know it was actually brought to Goa, India by the Portuguese in the Fifteenth Century. I did know that a lot of the Indian and Chinese food that we eat has been Westernised for our palettes but I never expected that it would have come from somewhere such as Portugal. One that I find a little self-explanatory, but others may just think could be just a name are French Fries. They are actually from France and not native to the likes of the USA or the UK. There are reports that President Jefferson was served a portion at the White House in 1802 so despite having been in the US for the rise of American Fast Food and the likes of McDonald’s and Burger King they are totally French! One thing I’ve never really thought about was the origin of fruit and vegetables so I was interested to find out that tomatoes originate from South America. 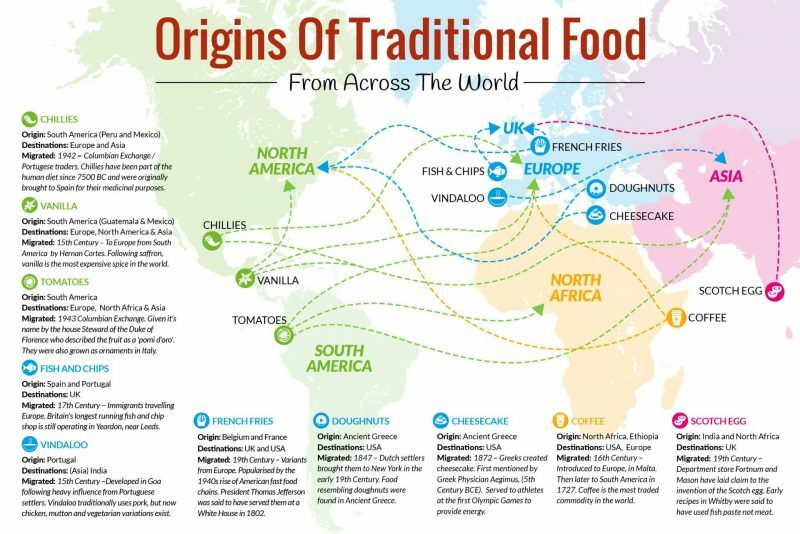 Having sat and then thought about it I probably would have guessed Italy or Spain as their home but they didn’t get there until quite recent in comparison to a lot of the other foods on the infographic. "A Fun Filled Night at Musical Bingo in Shoreditch *"
"Getting Up Close and Personal at the New Sea Creatures Exhibition *"